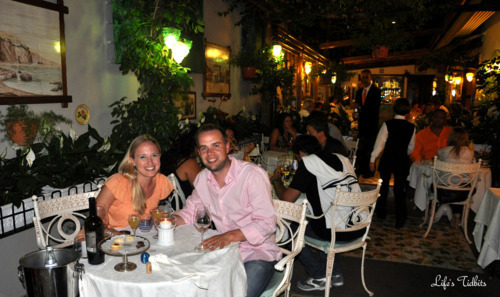 After spending three days in Positano, Italy we had a driver pick us up and take us to our next destination … Sorrento! The plan was to stay here the shortest amount of time and therefore find the cheapest place we could. We ended up staying at a cute little B&B on the main strip. We had decided to do a lot of sightseeing while in Sorrento so we were less concerned with staying at someplace “fancy”. Besides sleeping at night we weren’t really in the room so it worked out perfectly. This B&B was in walking distance of the port, train and a ton of restaurants. We arrived at the B&B, checked in, and went ahead and changed. 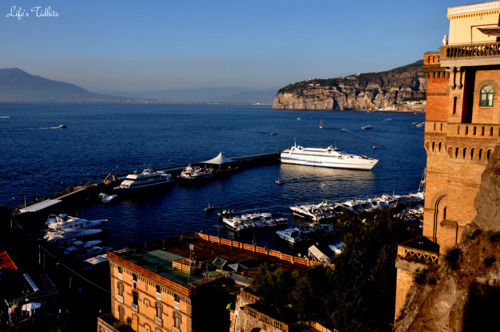 We walked around town a little and headed down to the port to catch the ferry from Sorrento to Capri. Once we arrived in Capri we had a horrible lunch (pizza & beer) at a “restaurant” near where the ferry dropped us off. Due to poor planning and arriving at siesta time we missed seeing the Garrato and ended up taking a bus to Anacapri city. The city was unfortunately pretty much shut down. We walked around for a while and then took the bus back down to the port. If you plan to explore Capri make it there early in the day. Our poor planning lead to a less than amazing day. Dinner however made up for our so-so day! After looking through TripAdvisor reviews for a long while my husband found Ristorante Bar Parco Ibsen. This place seemed a little weird as we walked down the path, but it was so romantic and the food was A-MAZING! 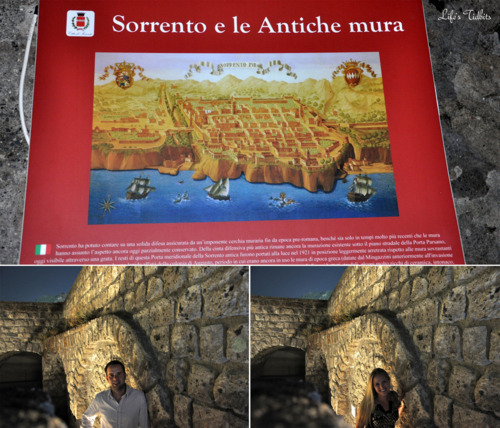 After a fantastic dinner we randomly walked past someone handing out brochures to see some new ruins. Although it was still “under construction” it was a fun way to spend 30 minutes. A little impromptu sightseeing! 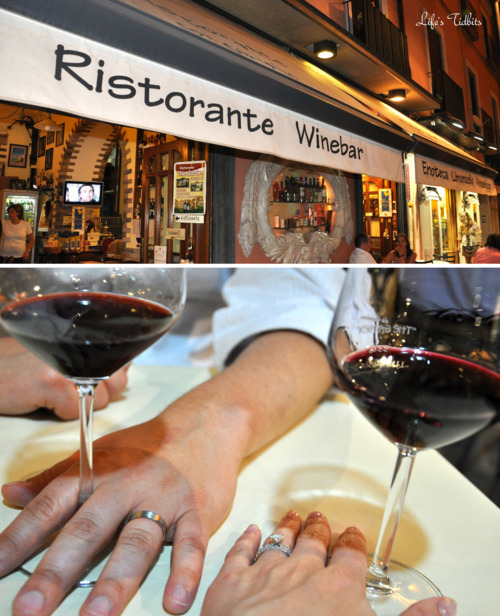 Despite our plan to head directly to bed, so we could wake up early for the trip to Pompeii, we ended up at a little wine bar just down the street from the B&B. It was crazy – the whole main strip had been closed to traffic and people were mulling about. It was so much fun to people watch and have a glass of wine. It’s our one week anniversary!! We totally overslept, but managed to rally and get to the train station. After a fairly quick train ride we arrived at Pompeii. My husband is super into the whole historical thing so we rented audio guides and headed off to see the ruins. One thing to note is we forgot to pick up a map! Seriously navigating around without a map proved to be difficult, but neither of us realized our mistake until it was too late. Thank goodness we have the Rick Steve’s book with us, which included a mini map of Pompeii. 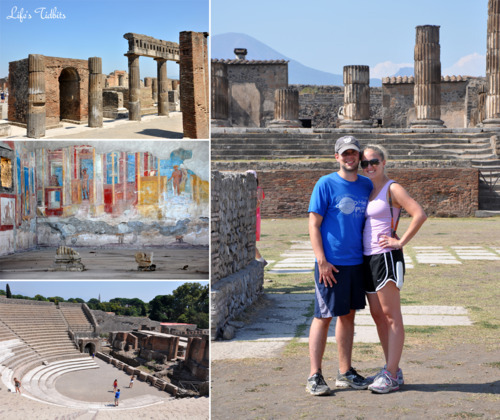 We spent the day wondering around Pompeii (and sweating a lot … Italy in August is HOT!). The husband was definitively way more into the whole experience than me, but overall it was a great day. Clearly since it was our one week anniversary we figured we should splurge on dinner. 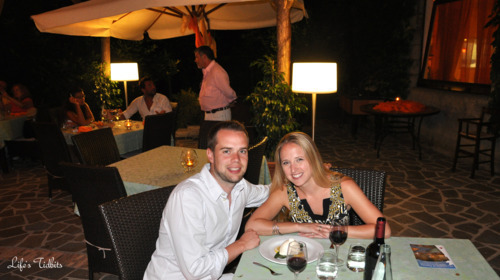 So we chose L’Antica Trattoria restaurant for dinner and ate a 7 course meal. It was WAY too much food, but it was also fantastic so C’est la vie. 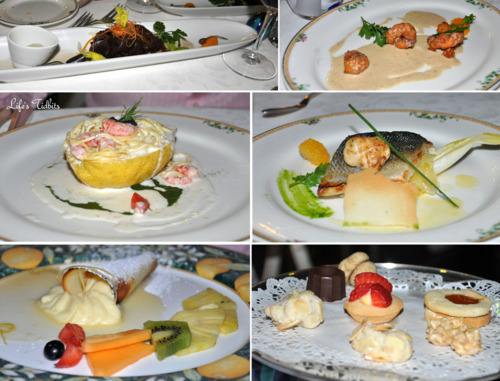 My favorite course was the pasta and shrimp with a lemon sauce served in a lemon! After dinner we rolled back to the B&B and hoped into bed. It was a long fun day, but we needed to rest up for tomorrow when we would be boarding the train for a long ride to our next destination. I think one more day in Sorrento would have been nice. That way we could have explore Sorrento itself a little more. This is someplace I would definitely like to return to one day. Caio! See you in Cinque Terre!